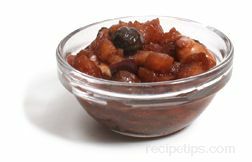 A sweet-flavored paste or chutney-like sauce that is made with uncooked fruits, nuts and seasonings. It is most often served during Passover seder and for various holiday events. 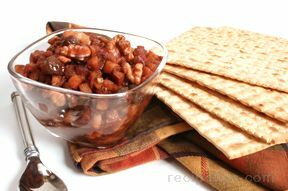 Although there are many variations for making Charoset, the traditional version consists of ingredients that include apples, walnuts, cinnamon, and honey or sugar blended together with a sweet kosher wine. Other recipes for this sauce may include ingredients such as dried or fresh fruits (apricots, oranges, pears, raisins, figs or bananas), pistachios, pine nuts, chestnuts, or almonds, and spices such as allspice, ginger, cloves, saffron, and mint, mixed with wine or amaretto liqueur. The recipes vary depending on the region of the Middle East where the Passover seder is celebrated. And for some, the ingredients are cooked together while for others there is no cooking involved or allowed. In the traditional manner of the Jewish faith, each Passover food has a symbolic meaning taken from history. For many, Charoset represents the mortar used to bond the clay bricks that built the structures for the homes and buildings within the cities of early Egypt. The color of the mixture attempts to resemble the colors of clay. This is important as a way to symbolize the hard work and dedication of the enslaved Hebrews as they worked to build a better life. Charoset is served on matzoh flat bread or other kosher foods and vegetables as a dipping sauce or topping.